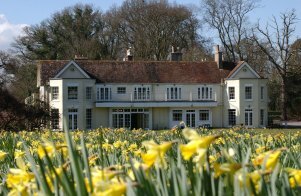 Tyrrells Ford Country Inn is a charming 18th century manor house hotel, standing in 8 acres of beautiful grounds on the edge of the New Forest. All the bedrooms are individually furnished with en suite facilities, hairdryer, trouser press, tea/coffee-making facilities and satellite TV. 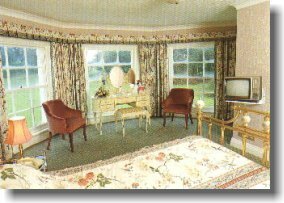 Many rooms have views over the lawns. 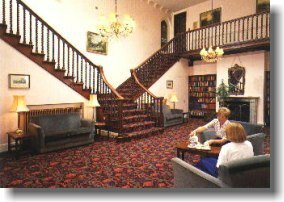 One outstanding feature is the majestic Minstrel's Gallery Lounge, which is licensed for civil weddings. The panelled, candlelit restaurant has earned independent commendations, as has the extensive bar menu. Both dining-room and bars provide views of the lawns and unspoilt countryside. Conference facilities are available. The Bedrooms are all en suite and have been individually decorated with charm, elegance and all facilities required by today's discerning hotel guest. Room Rates: Single £65, Double £100 - Including full English Breakfast (Dinner, Bed and Breakfast rates plus mid-week specials available on request). Room Equipment: TV, tea/coffee making facilities and hairdryer. Additional Information: Wireless Internet connection available, English Breakfast, Conference facilities, ample parking. Before lunch or dinner you can enjoy an aperitif in the comfortable bar. 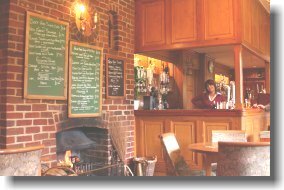 After your meal you can relax with the locals and enjoy a selection of traditional ales, cider and lager, or chose from a huge selection of wines and spirits. Food is also served in the bar and you can pick from a daily menu shown on a blackboard, or simply have a light snack. The Tyrrells Ford Restaurant offers traditional English breakfast, luncheon and dinner from the a la carte and table d'hôte menus, which are carefully prepared by our award-winning chef and complemented by an extensive wine list. Relax by log fires (in colder months) in the magnificent Minstrels' Gallery Lounge which is also licensed for civil weddings. Explore the beaches and shops of Bournemouth, Christchurch, Ringwood and Poole, all within easy reach, or plan to stop over with us when travelling to or from Bournemouth International Airport which is just 10 minutes (3½ miles) away. The Tyrrells Ford Country Inn is ideally located on the Hampshire/Dorset borders and the edge of the New Forest between Ringwood and Christchurch, just 4 miles off the A31 and the same distance from the A35. We are 15 minutes drive from Bournemouth, 1½ hours from London Heathrow Airport and only 20 minutes from Southampton. Excellent facilities locally for enjoying a round of Golf, Fishing on the World famous river Avon, exploring the New Forest, cycling, boating, swimming, sightseeing or simply relaxing!